Tesco's and RSPB have teamed up to support sustainable palm oil. But Tesco’s have more palm oil products on their shelves than I dare to count. Am I the only one who sees reason to be sceptical? Tesco's and RSPB are offering a committed individual (and you do really have to be committed...and available, with several test days over the course of the exam period) the chance to become a 'Rainforest Reporter'. The project is specifically aimed to support sustainable palm oil. But Tesco's palm-oil containing products can't all be sustainable. Palm Oil is taken from palm trees and used worldwide in everything from biscuits to what has been called 'biofuel' (called this merely because it is composed of biological products, not because it supports the environment in any way). The demand for palm oil is massive, and the majority of it is pooled from South-East-Asia. According to Greenpeace, 'Indonesia already has 6 million hectares of oil palm plantations, but has plans for another 4 million by 2015 dedicated to biofuel production alone' (Greenpeace - Palm Oil). The majority of this demand comes from richer nations, making it our problem far more than it is theirs. The problem with producing palm oil is that to do so large amounts of forest area must be cleared, and in its place are planted palm trees. In doing this, the canopy is destroyed, the wildlife relying on that canopy driven elsewhere or left to die through starvation. Much loved but endangered Orangutans are one such victim of this, while a member of the Penan tribe in the Malaysian part of Borneo told me that the forest is for them a supermarket. Without the natural food sources available in a hugely diverse jungle, their supermarket is destroyed. I am sceptical of the irony here that our modern version of a supermarket, one responsible for importing the Palm Oil which is destroying the natural supermarket my good friend was referring to, is claiming to save the jungle. In 2009 Tesco's and other supermarkets were exposed in what was dubbed by WWF 'Palm Oil Shame', for selling their products using unsustainable palm oil. One year later Tesco's promised to use only 'sustainable' palm oil, and joined the Round Table on Sustainable Palm Oil (RSPO). The word 'sustainability' is used rather too frequently in today's age of climate change concern: it makes sense when we speak of providing local people with the tools to build their own survival in time. Sustainable fishing means fishing without killing off all the fish, so that you can continue fishing. But planting Palm Oil sustainably is a concept which I think deserves more attention. Unsustainable Palm Oil can refer to the easy to criticise 'slash and burn' methods of jungle destruction, whereby not only are jungle areas destroyed, but local people are forced out of their homes and the ground is destroyed with little care or awareness so that wildlife are killed and the canopy cannot grow back. Sustainable Palm Oil, then, turns away from this, but I have been searching the internet trying to find some background to the word 'sustainable' on the subject of Palm Oil, and no website, blogger, or journalist has seemed to be able to answer that, while the organisations don't go any further than merely repeating the word. It's as if no one really knows: they're all just pretending, telling themselves they know how to save the jungle, when they have no clue. Greenpeace seems to suggest that any palm oil plantations converted from jungle areas is unsustainable. In response to that I would have to ask, in such places as South East Asia, what wasn't jungle? 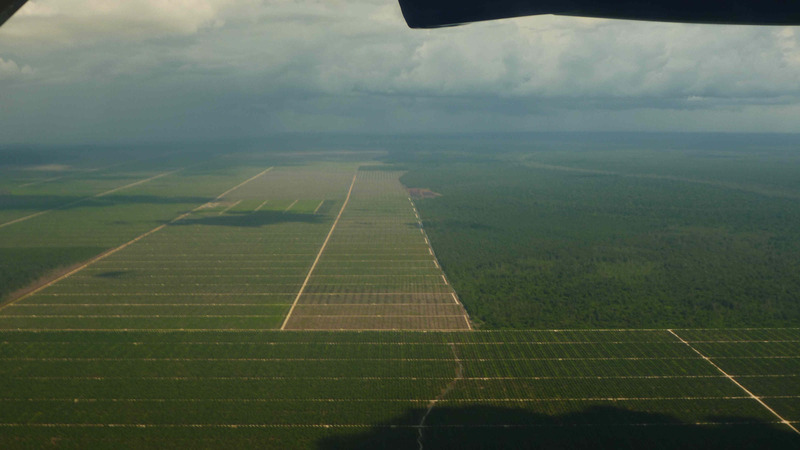 In order to farm palm oil you have to destroy the canopy unless you have, as if by magic, found a place where palm oil is already growing over thousands of hectares. A video by the RSPO lists what it is that they do for sustainability, and these include the 'recycling' of plants, as opposed to burning or logging them. But this isn't like the organisations who pledge to plant a tree for every book they sell or every product they make: endeavouring to replant every tree within the hectares of jungle territory destroyed for palm oil is unrealistic, and they are hardly surveying every type of plant that's destroyed (right, this one's poisonous, let's replant that one...and this one is a sago plant, okay...) as if the canopy can grow back within a day, retaining it's diversity. On top of that, it's hardly what they've said. So let's have a look at the other promises within this video: Fertiliser will be used on the palm oil (in natural areas which have never had fertiliser), but apparently it's sustainable, whatever that means. Second, buffalo's are being used to transport supplies - well, that won't take long to be complained about by animal rights activists. Finally, the RSPO certifies products which have been made sustainably. Personally, I've not seen anything when I've been walking the aisles through Tesco's, staring at the ingredients of peanut butters and trying to find one which doesn't have palm oil within it. Beware that the video is slightly utopian, even ending with a pair smiling on bicycles. Personally, I don't trust any organisation which titles their video 'The Gathering Momentum' and expects us to think that such a statement makes sense. Still, the RSPO has been running since 2004 and has the support of not only supermarkets, including Sainsbury's which helped to launch it, the RSPB (and Tesco's), but also the WWF and - well - if they see something in this idea, then there must be something good there. But Greenpeace has found evidence that unsustainable practices are still going ahead, under the eye of RSPO; that, essentially, sustainability when it comes to palm oil is all just an 'illusion'. Additionally, a certification organisation, 'Green Palm', suggests that sustainable palm oil is simply the only viable solution at the moment. You can't boycott palm oil goods because the demand still exists elsewhere in the world and if you do, your country be out of the economy, just like that. The demand for palm oil is so high, and our alternatives so low, that the only 'solution' at currently is raising awareness and telling people to be careful. Given that, I suppose, we must be happy that RSPB and RSPO and Tesco's exist to take these matters so strongly into their own hands. We can't stop using Palm Oil - it's in our cars, it's in our biscuits, it's in our cosmetics (although, frankly, I do not believe that many of them are a necessary part of living), and even many of the tribes, a little influenced by the outside markets, eat the biscuits. Tesco's, I suppose, can at least finance our positive efforts further, even if palm oil - sustainable or unsustainable - is practically spilling off their shelves. Nobody can say that we're not trying to avoid falling into the abyss with our burning trees above us, but we could do a little more. My solution? Use only what's necessary. We don't really need to fill up the shelves in Boots with cosmetic products. Ladies, let's not feel as if we actually have to use these products! Killing species, and potentially ourselves, because we have been taught to dislike the way we look is hardly justifiable. So next time, women of the world, when you smother your bodies in cosmetics, think of the dying trees, and the orangutans. You'll never step into Boots again. Boy racer? Teenager in driving ban after drunken spin... on a lawnmower.